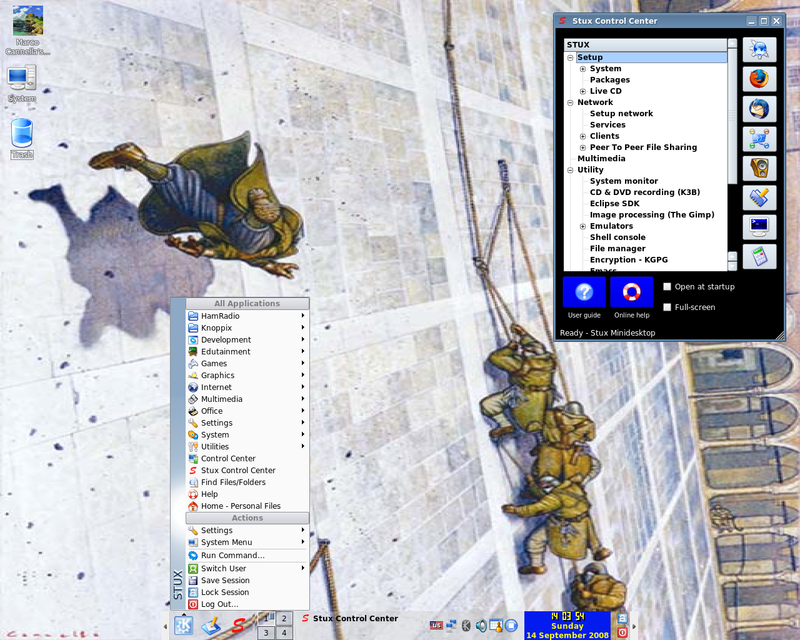 HandyLinux was a French distribution designed for novice Linux users. It was based on the latest stable version of Debian GNU/Linux and it uses the Xfce desktop environment. The main feature of the distribution was a custom start menu with applications and Internet bookmarks grouped in tabs. HandyLinux integrates the latest versions of the Chromium web browser, LibreOffice office suite, Skype conferencing and messaging client, VLC video player and other popular applications with the stable Debian base. Rate this project A new version of the Slackware-based STUX GNU/Linux live CD has been released. What's new? "Based on Slackware current as at 8 October 2006 (Slackware 11.0); Linux kernel upgraded to 2.6.17 from KNOPPIX CD 5.0.1; KDE, and all programs executed from KDE, now run as unprivileged user; user management, also when running from live CD, is more sophisticated; various services have been hardened; added udev, Tor, 3D-Desktop, MPlayer, Icecast, lm_sensors, Lopster, wpa_supplicant; now using wireless and network initialization scripts from Alien BOB; all STUX utilities reviewed and enhanced; faster boot; enhanced wireless networking support; many other changes, fixes and enhancements." Visit the project's news page to read the release announcement and changelog. STUX 0.9.2 is available for download via BitTorrent: stux-linux-0.9.2.iso (654MB).